Navigating the healthcare system these days can be complicated, to the point that all those hurdles and hoops can get in the way of finding the care your loved one needs. Finding healthcare shouldn’t be so complicated! At Evergreen Home Healthcare here in Denver, we understand how difficult it can be to not only navigate insurance and find coverage, but to find professional and compassionate care for your loved one. Choosing a care provider should be based on whether or not they are the right person to provide care, not because they were the first in-home health aide to meet your insurance’s criteria. Our comprehensive home health care services are designed to help you through every step of the home care process so you can focus on finding the best in-home care for your loved one. Home health care is more or less what the name implies. It is the combined efforts of licensed therapists, nurses and CNAs, and social workers that is designed to enable those with special needs or those who need extra care to live as full and fulfilled a life as possible. This can include everything from in-home rehabilitation to facilitate better surgery recovery for an elderly parent to ongoing occupational therapy for a special needs child—and just about everything in between. An in-home health aide means you can minimize hospital stays and ensure your loved one still receives the medical care they require, but it can also mean bringing regularly scheduled therapy sessions to your home, rather than go through the hassle of traveling across town for every appointment. 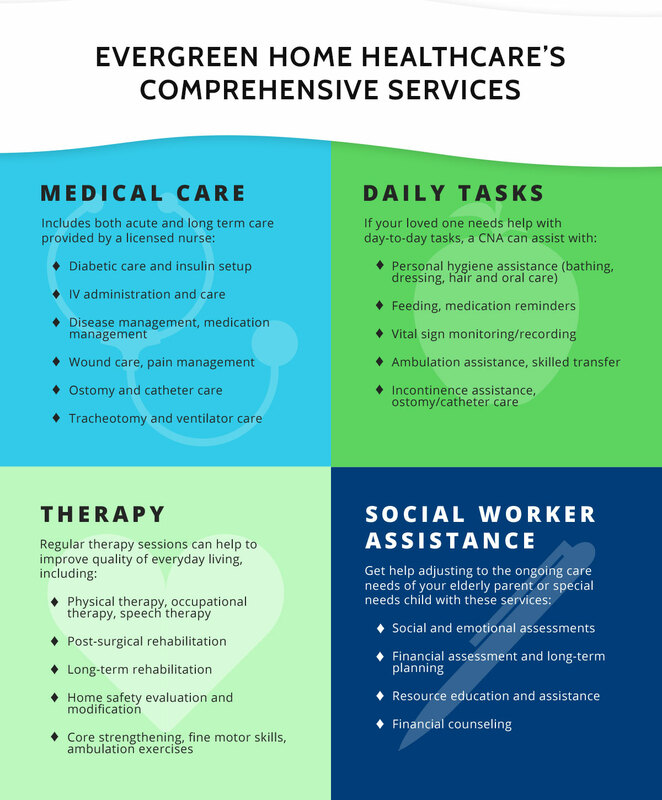 Home health care services generally fall into one of three categories: acute or long term medical care, therapy, and/or social worker services. At Evergreen, we strive to provide comprehensive and compassionate services across Denver, which means that our assistance is there for you and your family just as much as it is for your loved one who needs care. We can help you modify your home to make daily tasks easier, help you set up a schedule to balance everything, send an in-home aid to care for your special needs child so you can get household tasks done or go to another child’s after school activities, and so much more. We even have social workers who can help you navigate health insurance coverage and work with you to develop a long term plan to ensure your loved one can continue to receive the care they need. If you have a loved one who needs medical care, ongoing therapy, or other assistance to enjoy the best quality of life possible, the Evergreen team is here to help. Learn more about what we can do for you; give us a call today! Could Your Loved One Benefit From An In-Home Health Aide? In-home health care isn’t limited to those who need round-the-clock medical attention. A comprehensive adult and pediatric home health care service like Evergreen can provide every level of care necessary to help your loved one enjoy a better quality of life. From in-home therapy services to pediatric home nursing care, hiring an in-home health aide can help in nearly any way you need. Are you unsure whether an adult or pediatric home health aide can help your loved one? The following are a few of the most common services we provide. Whether your loved one requires assistance with several items on the list or only one, an in-home health aide could help improve the quality of life for your loved one! Whether your loved one requires routine therapy appointments or round-the-clock care, an adult or pediatric home health care professional can help make your routine more manageable and boost your loved one’s quality of life as much as possible. 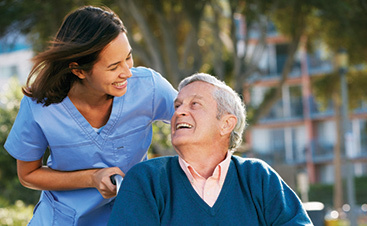 If your loved one needs 24 hour care, it may seem obvious that a home health aide would help. Conversely, if your special needs child sees an occupational therapist or a speech pathologist a few times a week, it’s understandable that you might not immediately think a home health aide could be beneficial. But, when you have a loved one who needs ongoing therapy or medical care, those can be heavy calls on your time and affect family life. No matter how much or how little assistance you need, Evergreen is happy to work with you to create the right care plan to help our your loved one and the rest of your family. From education to assistance, we’re ready to help! Depending on your child’s needs, you may be able to provide that care yourself. Depending on your child’s needs, you could earn your Certified Nursing Assistant license and be legally qualified to provide the in-home care your loved one needs. CNAs are not licensed to provide all levels of medical care, but that training can allow you to provide the day-to-day care that your special needs child or family member requires. Providing your loved one with the best care possible may mean ensuring someone close to and familiar to your special needs child should offer that daily care; becoming a licensed CNA gives you the ability to provide that care. As a licensed CNA, you could offer daily care needs such as vital sign monitoring and recording or ostomy and catheter care, rather than relying on a pediatric home health aide to come to your home and do that for you—or, even less convenient, making frequent trips to your local care provider. If this is of interest to you, learn more about the Certified Nursing Assistant licensing process by contacting our team. How many days a week do you have to go through the routine of loading up the car and driving thither and yon to bring your special needs child to therapy sessions or medical appointments? If it feels like you are forever in the car, there is a better alternative. A pediatric home health aide can cut down your travel time every week and otherwise help free up valuable time in your routine. Even more importantly, having your child’s pediatric home healthcare needs to be attended to at home is generally better than traveling so much and having their daily routine disrupted so frequently. Working with the Evergreen team means we can come to you, saving you travel time and helping keep a consistent routine for your child’s care. Whether your child needs ongoing medical care, routine therapy, or even short-term pediatric home care, we can help you spend less time at hospitals and in therapists’ offices. Many special needs children are more receptive to therapy when it happens somewhere they are familiar with and feel comfortable. The Evergreen Home Healthcare team can arrange to bring occupational therapists, physical therapists, and speech pathologists to your home, so your child can work on their fine motor skills or ambulation at home. We can also provide education and teach you ways to help reinforce those therapy sessions throughout the day. In addition, our pediatric home health team can provide a home safety evaluation and work with you on home modifications to further help your child’s daily quality of life. 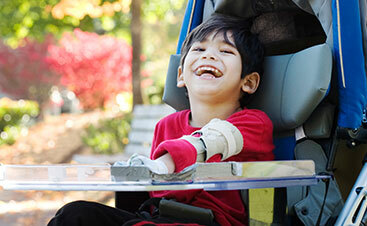 We don’t restrict our pediatric home health care services to special needs children or long term needs. Our team is licensed and experienced in helping with a wide array of medical care needs, so we can help out on an acute basis. 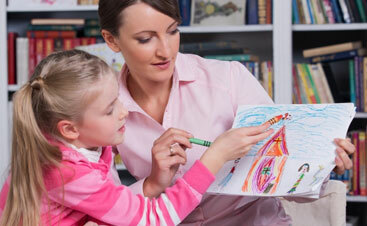 We work extensively with Children’s Hospital and the other hospitals and institutions across Denver. If your child requires medical care while recovering from a surgery or illness, we can bring the necessary medical care to your home and minimize time spent in the hospital. Long term care can encompass a wide range of needs. It may mean assistance and care through recovery from an ongoing or long-term illness, or it may be care needed throughout life. From regular therapy sessions to ongoing medical care, our pediatric in-home care services can be customized to fit yours and your child’s needs. Our skilled nursing staff can help with a wide range of medical needs, to help minimize any hospital time. Whether your child needs around-the-clock care or occasional but ongoing assistance, we can work with you to arrange the right home care plan. As we age, the stress of life and genetics can take their toll. If you have an elderly parent or loved one who needs additional assistance with daily life, in-home care can be a better alternative to extended hospital time or a nursing home. A home health nurse can travel to your loved one’s home and provide a range of different healthcare services, from medical to therapeutic and even assistance with day-to-day activities that have become too hard to handle alone. Retaining as much independence as possible, despite health issues, helps your loved one’s overall mood and wellbeing. Let our home healthcare team provide the necessary assistance so your elderly loved one can remain in their home and remain as independent as possible without risk to their health. Has your elderly loved one recently gone through a hip replacement surgery? As much as we might wish, the healing process is a long one and, the older we get, the more slowly our bodies heal. Our home healthcare team can provide in-home monitoring, wound care, and rehabilitative services to help your loved one recover from their surgery or hospitalization. Our in-home care services can help minimize the time they’ll need to stay in the hospital and ease them on their way to recovery and independence once more. Sometimes, health issues and aging can bring about the need for ongoing care. For example, Alzheimer’s Disease and dementia are prevalent issues among the elderly, and both can make it increasingly complicated—and often, dangerous—for your loved one to live alone. Rather than move your loved one from their long-time home, an in-home health aide can provide the care and safety net to allow them to remain in their home. Whether the necessary assistance is occasional physiotherapy and ambulatory assistance or it’s a more involved care need, like medical monitoring or daily hygiene assistance, our in-home healthcare options can help your elderly loved one retain as much independence as possible. Hiring someone to come provide healthcare services in your home involves a good deal of trust. It’s important that you feel comfortable with anyone providing medical care, therapy, or other healthcare help for your loved one, and we would never suggest hiring someone if you haven’t met them and checked credentials, at the very least. Before hiring Evergreen or any other home healthcare provider, here are a few important things to keep in mind to help you find the best care possible for your loved one. Yes, this may sound like a standard job interview question, and that’s because it is. As much as you may want to get to know potential caregivers organically and see how they get along with your loved one, you are still hiring someone to come into your home and provide therapy, medical care, or other home care assistance. You should absolutely be comfortable with anyone coming into your home, but you should also know that they have the necessary training and up-to-date licensing to help your loved one’s specific care needs. 2. What are your experiences in home healthcare? Not only do you want any in-home care provider to be qualified and have current licensing, but you also want to know that they are experienced. When working with a home healthcare agency, you can go in with a realistic expectation that anyone on the team will have home care experience, but it’s better to get more specific, especially if your loved one has delicate medical needs. As an example, if you’re looking for a pediatric home health aide, you may or may not want to hire someone who has only worked with elderly patients. Of course, use your best judgment, as someone who only recently earned their RN may not have a resume full of experience, but their nursing program may have provided plenty of hands-on experience. 3. What interests you in home healthcare? You’ve probably heard statistics about how happy employees do better work. When it comes to your loved one’s care and quality of life, emotional well-being is just as important as those physical needs. And, like teaching or law enforcement, healthcare is not just a job, it is a calling. Asking a potential in-home caregiver’s interests will help you gauge how well they will fit in with your family. 4. How comfortable are you working with my loved one’s mental state? This can be a very important question to ask whether you’re looking for adult or pediatric home care. A nonverbal child with Downs Syndrome or an elderly parent with Alzheimer’s may be prone to frustration, confusion, and have trouble communicating their needs. If you’re looking for a care provider for a loved one with mental development issues or memory loss, your care provider will need a wealth of patience and compassion to provide the necessary care. 5. Will you agree to a trial period? Once you know someone is qualified, experienced, and comfortable helping your loved one, the other element to check is how well they mesh with the person who needs care—and, to some extent, the rest of your family. Of course, this will vary depending on how much assistance is needed and how much time they’ll be spending in your home, but if the caregiver will be spending a good deal of time with your family, it’s important that everyone is comfortable. A trial period of a week or two can give you a good well-rounded view of how that person will fit into your lives. Often, the hardest part of navigating the healthcare world is wading through insurance policy coverage and figuring out payments. Doing is becomes even more complicated when the care will be necessary for weeks, months, or years. We understand how daunting a process this can be. The Evergreen team has plenty of experience navigating insurance coverage, Medicare and Medicaid, and finding other resources to help you cover the cost of care for your loved one. Whether your loved one needs care for a few weeks for on an ongoing basis, our home healthcare team can help you navigate insurance, find extra resources, and even create a long term plan for ongoing care. The social workers on staff can help you no matter where you are in the home care process and help set you up to be in the best position going forward. You do not need to go through this process on your own. Whether you need short-term help or ongoing, adult assistance or pediatric home care, we understand how overwhelming it can be when you are in a situation that calls for home healthcare. The above link for additional resources is meant to get you started finding ways to help ease your burden. Find federal, state, and local financial assistance as well as community support groups, advocacy information, programs for those with disabilities, and so much more. We want to help you build a network of support, find life-enriching activities, and otherwise help you make life as full as possible for your loved one as well as your family. Work with a licensed clinical social worker on the Evergreen staff for help creating a comprehensive plan and getting connected with the most helpful resources for your loved one’s needs. Do You Feel Called to Provide Compassionate Care? Evergreen is always looking to grow our team of caring, compassionate, experienced in-home healthcare providers. Not only can we help you through the process of becoming a CNA parent, as we mentioned above, but we are always looking to grow our family of caregivers. We hire all levels of nursing—CNAs, LPNs, RNs, and Nurse Practitioners—as well as licensed clinical social workers and therapists. You can learn more about our benefits and view current openings on our employment page. We are looking for those who feel called to nursing as a vocation, for those who are excited to touch the lives of the patients and families we serve across the Front Range. For flexible nursing jobs in Denver, contact us to learn more about the benefits that working as an in-home caregiver can provide and see how you can join the Evergreen Home Healthcare family.